An Entry for the A to Z Blogging Challenge . Dr. Avul Pakir Jainulabdeen Abdul Kalam born on October 15th 1931 at Rameshwaram, Tamil Nadu, India. He did his specialization in Aero Engineering from Madras Institute of Technology. And started his initial job with DRDO in the year 1958 then he joined ISRO in 1963. India’s successful launch of satellite vehicles of ISRO and the missile program of DRDO is the brain work of this humble and simple scientist. As a project Director his contribution(Design, Development and management) to the indigenous Satellite Launch Vehicle SLV –III is tremendous. He worked as Scientific Adviser to Defence Minister and Secretary, Department of Defence Research and development for a period of July 1992 to December 1999. He took up academic pursuit as a Professor, Technology and Societal Transformation at Anna University and involved in teaching and research. He ignited the student community for national development across the nation. There is more than 30 Degree of Doctor of Science (D.Sc. Honoris Causa)conferred by 30 universities/academic institutions. He is also the recipient of several awards including the Indira Gandhi Award for National Integration 1997. He has been awarded Padma Bhushan in 1981, Padma Vibhushan in 1990 and Bharatratna in 1997. And in July 2002 he became India's 11th president. His passion for teaching is still going on and promoting the national development across the nation especially in the midst of school children. 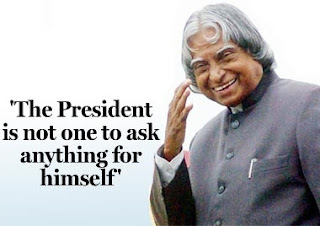 He is the author of many books out of which the "Wings of Fire" An Autobiography of APJ Abdul Kalam stands apart. "God may not be realized without intense yearning, longing or sincerity; we may not see him without practicing rigorous austerities but we can certainly see his manifestation in a few great personalities. Kalam, our beloved President – Scientist – Leader – Philosopher–Saint– Musician–Writer–Philanthropist– Missile man–a Visionary- - - -, is a diamond in the Necklace of Mother India, and undoubtedly a role model for all of us. His Autobiography, Wings of Fire is a book of Positive thinking; it helps us to learn about how a person born and brought up in a remote village, has taken, seen nothing but positive aspects of those he met, lived and worked with; and how he assimilated, practiced the values of great visionaries Vikram Sarabhai, Satish dhawan, Bramhaprakash and succeeded in making the country march towards excellence in the field of Science and Technology." Hi Ann! I just had to stop by and see the last person (so far) who signed up for the Challenge. Thank you so much for dropping in and for the encouraging welcome. Very kind of you. The Evolutionists Are Coming …. Live Sprouts A Duper Super Food For Your Body!! !